Google+ Reading Teen: National Book Festival 2010 in Washington D.C.
National Book Festival 2010 in Washington D.C. The Reading Teen Crew is very excited about this years National Book Festival on The National Mall . This is an annual event held every year in Washington D.C., just to celebrate the love and reading of books. I am so loving that! 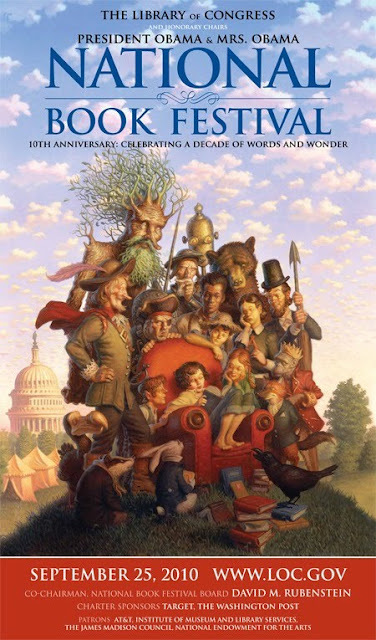 This will be sponsored by The Library of Congress and this event gives everyone the opportunity to visit with more than 70 award-winning authors, illustrators and poets who will talk about and sign their books. National Book Festival Pavilions are set up for everyone's taste,topics and genre, however we will be in the TEEN section if you want to find us!!!! So yes, we are very excited to take our own Hunger Games trilogy books and get them signed by Collins herself. Let us know if your deciding to come, Maybe I could plan a HUGE pick-nick under the trees on the National Mall. *Seethes unhappily* I'm dying! I want to go so badly! Oh, the curse of living across the country. O-M-G! A signed Hunger Games! I'd kill for one of that! Livia,Livia,Livia we will take lots of pics. So wish you could join us. Hi! I have passed on the summer blogger award to you guys! Thanks for the awesome posts! Ooh! I'm going, I'm going! Haha! Maybe we can meet up? I'm so excited to see that another blogger will be going! balletanne@gmail.com, just in case you want to talk about meeting up at some point! What about that hand injury? EH? I went last year. Just an heads up the major authors start to limit their books you can get signed the further back in line you are because they start running out of time...so if you want all three signed get there early early so you can get up front. I'm going! But I've been looking everywhere and cannot find which tent she's in and at what time. Does anyone know?! steady income pay day loans uk you are giving your ssn and also other financial details.